Anthony Tantillo was born in Niagara Falls, New York. From a very young age, he knew he wanted to be a lawyer and help the people who needed it most. 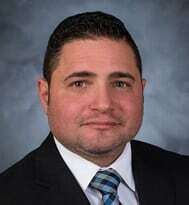 Anthony graduated from Buffalo State College in 1998 and went on to earn his Juris Doctor from SUNY Buffalo Law School in 2002. That same year, he was admitted to practice law in New York. In 2011, he joined the team at William Mattar, where he enjoys trial practice and helping people with personal injury cases. Anthony is dedicated to his clients and was selected by his peers for inclusion in New York Super Lawyers® for seven consecutive years 2012-2017. In his spare time, Anthony enjoys weight lifting, watching movies, and spending time with his wife and three daughters.